Naveen noticed that there was a lot of pollution in the school caused by the smoke of cooking fires when mid-day meals were prepared. The thick black smoke and soot hung heavy in the classrooms, making his friends choke and suffocate. The same thing used to happen every day back at home, when his mother cooked their dinner. The entire family kept on coughing and rubbing their eyes. He set about finding a solution, and voila, the boy soon developed an eco-friendly way of cooking using natural yet unconventional fuels! And that was just the beginning. His invention was one of the 70 chosen from a pool of 450 inventions to be showcased at the state level. From there on, Naveen was chosen to participate in the same competition at the national level. The ultimate success came to him when he was one of the five awarded the national prize! 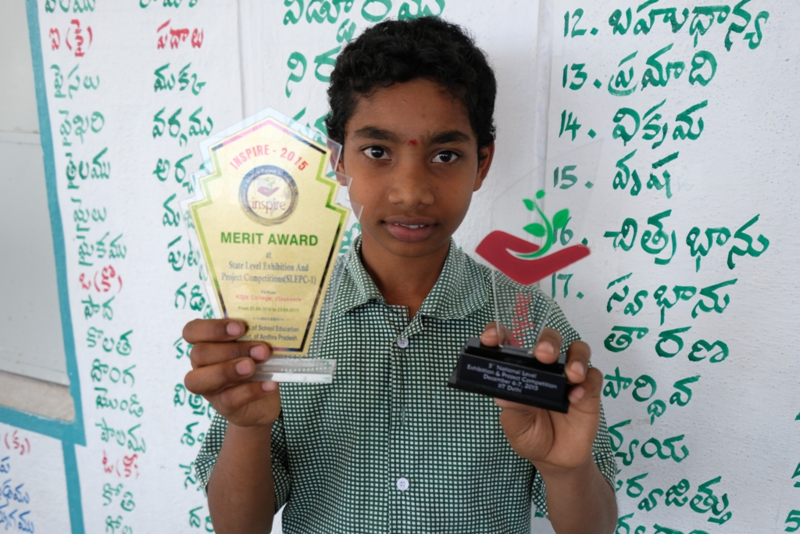 While anyone would be excited about getting national recognition, for this boy who had just come back to school after being a child labour—this award meant something much bigger. It was proof that given the freedom to pursue his passion, he could create wonders. Breaking the barriers created by child labour, Naveen now dreams not only of a better future for himself, but also for children around him. Naveen’s invention today is being used in a few schools near his village, and the recognition has brought a wave of change, in his community. As Naveen sets his sights higher and dreams of becoming an engineer, he has already become the inspiration for many children who now believe that nothing is impossible. Life had always been hard for Naveen and his family. His father was a small time vegetable vendor without the means to expand his business and the boy had to drop out of school in the 4th grade, to start working at a roadside tea stall and contribute to the meagre family income. When the project staff of PORD (People’s Organisation for Rural Development ), a local grass-root level NGO supported by CRY, got in touch with him and tried to get him back to school, initially there was fierce resistance. The reasons were very simple—in the small village of Madanapalli in the Chittoor district of Andhra Pradesh, where Naveen lived, it was very common for children to drop out from school and get engaged in work. Naveen’s parents did not quite understand why their son should not follow suit. The promise of a mid-day meal for their son was not an incentive enough for them to give in. They knew child labour was punishable by law, but without the income Naveen was bringing in, their survival was at stake. His father has applied for a loan to support his business and it was an added burden on the family. However, after several rounds of discussion, Naveen’s parents relented and sent him back to school, while the team from PORD helped them get ration cards and Aadhaar cards so that they could access government schemes like PDS to help ease the financial burden to some extent. This was the turning point in Naveen’s life. Armed with the second chance to a better life, Naveen jumped at the opportunity to connect with the local children’s group. This helped immensely because his peers could keep him motivated and help him adjust to being back in school. His immense interest and aptitude in science compelled the school to enroll him in a district-level science competition. And the rest is history. Every human in this nation, who knows life and has qualified and living decently in metros, should get down and create Village or tribal or valley activism and create Entrepreneur Development Skills to set of few youth concentrating single village , consistently for a year. Yes My Dream bharath will emerge and Rama Rashtriyam will emerge.